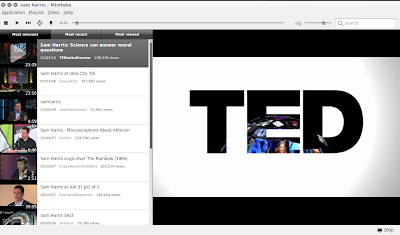 Minitube is a flash free YouTube desktop application for Linux and Mac OSX. Minitube is perhaps one of the cleanest looking YouTube desktop client I have ever used in Ubuntu. And the fact that Minitube does not use the Flash player to play videos makes it a really low consumer of your CPU resources. Minitube interface looks nice and simple. All you need to do is, enter the keywords into the search box and hit 'enter'. Minitube will find what you are looking for. Minitube plays HD videos up to 1080p. And there is an option to go full screen as well. Since Minitube does not use Flash Player, Minitube in turn preserves battery life and keeps your laptop cool. Minitube adds up as a YouTube video downloader as well. Videos are downloaded in MPEG4 format. You might also want to learn howto download YouTube videos in Ubuntu without any dedicated application. How to Install Minitube in Ubuntu Maverick, Lucid via PPA? Simply do the following in Terminal to install latest Minitube in Ubuntu. Done. Applications - Sound and Video - Minitube. Minitube download instructions for users of Mac OSX and other Linux distributions can be found here. Minitube is working flawlessly in my Ubuntu Maverick.